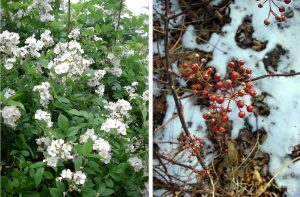 Multiflora Rose (aka Rambler Rose) – Rosa Multiflora – is on lists of invasive plant species for Nova Scotia but few people are aware of that and many plant it as a robust ornamental and also as food for birds. “Native to Japan, Korea, and East China, Multiflora Rose is thought to have been introduced to Nova Scotia in approximately 1886 for ornamental, erosion control, and livestock fencing purposes” reads an HRM document on invasive species. I never paid it much attention until in 2007/2008 I viewed Rosa multiflora climbing over trees near the model railway in Windsor, NS, and rampant in pastures in the area of Smiley’s Park. I observed those occurrences in early July when it is in flower and highly visible. Since then I have kept an eye out for it in the Halifax area. It wasn’t until 2012 when I began to see occasional infestations such as I had seen in the Windsor area, e.g. along sections of route 333. So, it appears that R. multiflora is just beginning to invade Sandy Lake and Environs. What about nearby? Where might it be coming from? 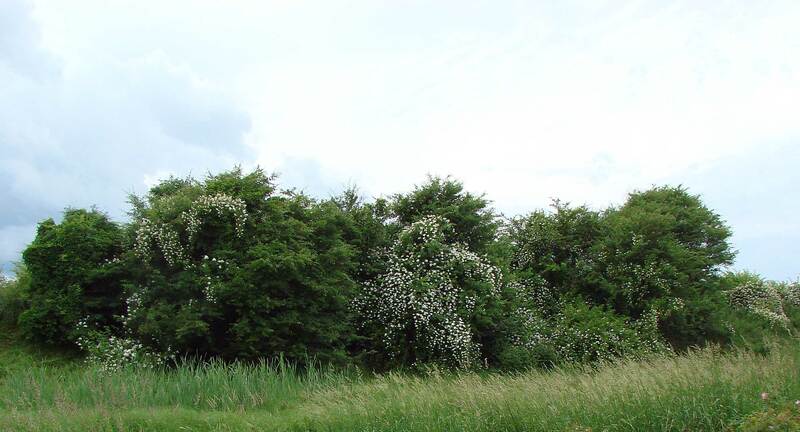 Occurrence of flowering R. multiflora in early July, 2018. 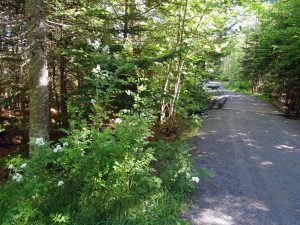 In early July, 2018, I conducted some quick surveys for flowering R. multiflora in settled areas/roads/trails adjacent to Sandy Lake & Environs. 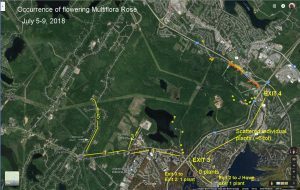 R. multiflora is well on the way to getting established along the Sackville River/the Bedford-Sackville Greenway Conector Trail (See Map; and Photos). SO…WHAT SHOULD BE DONE ABOUT IT, IF ANYTHING? What might be done about it? My view is that where R. multiflora is already well established it would be very hard to bring under control, and I am not sure there would be any great value in doing so. On the other hand, where it is not established or only a few, smaller plants occur, it can be kept out quite readily with hand clippers and a little year-to-year vigilance. Thus I suggested in 2016 that for Point Pleasant Park, efforts be made to keep it out along paths where it is currently sparse, and deal with the heavy infestations secondarily, a recommendation they appear to be following. (View Multiflora Rose in Point Pleasant Park, Halifax). 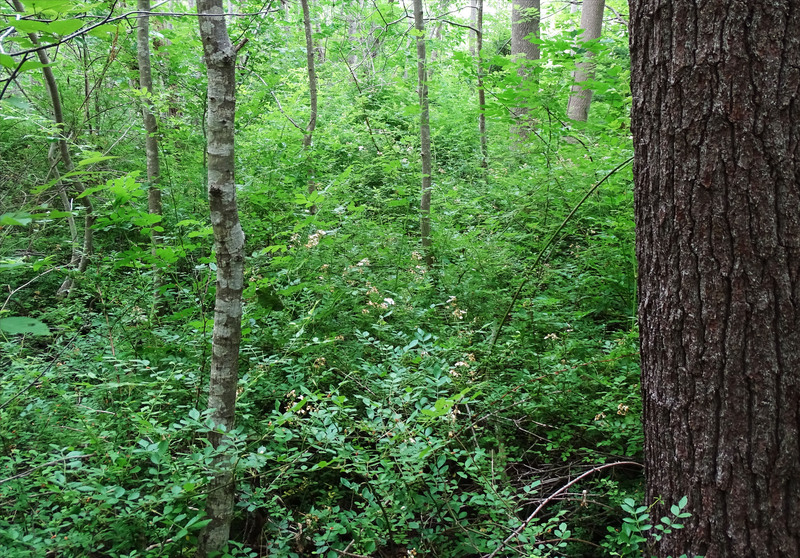 *PPP managers had made a formal plan in 2008 (as part of the Point Pleasant Park Comprehensive Plan) to get rid of invasive species and stop new ones coming in but dropped the ball on R. multiflora – it was not even cited as an invasive species in the park in 2008, but was well established by 2016. In my experience, when you cut a fairly large bush (e.g. 5 ft high, 10 x 5 ft ground area) down to ground level with hand clippers, it will take at least 2 years before flowering branches appear again. So if there are only a few smaller plants, that’s easy to do every few years. But if you let it go, the plants can become massive with stems requiring a saw, not hand clippers, to cut; and also very numerous. 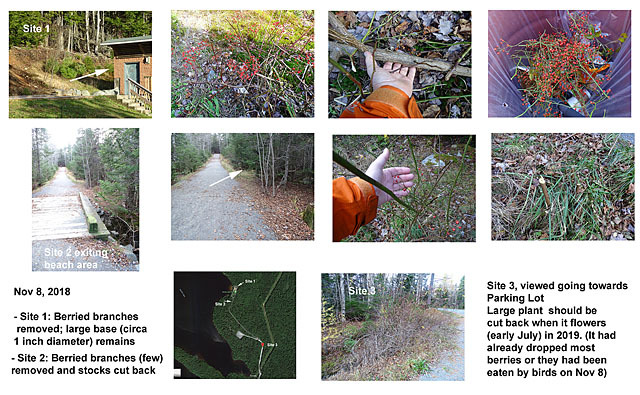 So I see the “Monitor-and-Cut-Back-flowering plants strategy” as a practical, workable approach for small properties or along trails where it is not already numerous and large. Monitoring is best conducted when the plants are in full bloom, in early July in the Halifax area. Plants should be cut back before the fruit matures and then becomes food for wildlife – and distributed by wildlife. Eradication of larger plants can require physically pulling them out (e.g., with the help of a truck and winch) or digging them out, or cutting them at the base and applying glyphosate. 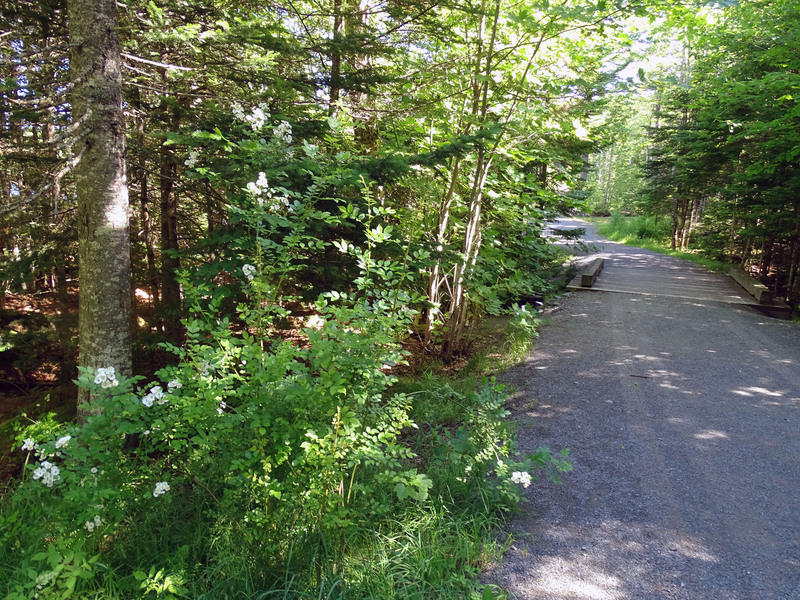 In the case of Sandy Lake and Environs, for now I will recommend to HRM that the plants on or close to Sandy Lake Beach Park be cut back, also the plant close to the trailhead for the Jack Lake Trails (and I will volunteer to do it)*. I think that it will be difficult to eradicate and keep plants out in the vicinity of the NSP Road at the eastern extremity of the Jack Lake lands. 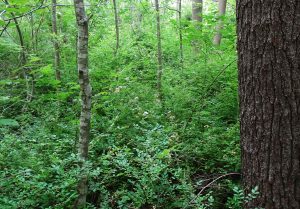 However, it would be worthwhile noting and removing plants along trails into the Jack Jake lands where it is currently absent or sparse. *Nov 8, 2018: My hand clippers were no match for the large plant beside the washrooms (the main stem was hidden in vegetation when I viewed it earlier) so I removed just the branches with berries. I removed berries and cut back the plant just outside the beach area. There is a very large plant just before you enter the Parking Lot – there were few berries left there and it is far to big to be cut with hand clippers. There are more plants further out on Smith Road, but I suggest the priority area should be from Site 3 (just before big parking lot) to Site 1 (beach area); it is still practical at this point to keep the R. multliflora under control in that area. The photo album contains photos and videos related to the surveys I conducted in early July, 2018, for flowering R. multiflora in settled areas/roads/trails adjacent to Sandy Lake & Environs. The photos are GPS-tagged and as you go through the photo album, you can follow the route on a google map. Description of the species, its impacts and how to control it. Kurtz, Cassandra M.; Hansen, Mark H. 2013. Res. Note NRS-182. Newtown Square, PA: U.S. Department of Agriculture, Forest Service, Northern Research Station. 5 p.